It was the start of something big when New Belgium Brewing of Fort Collins, Colorado—makers of Fat Tire Amber Ale—became partially owned by an ESOP in 2000. The company transitioned to 100 percent ESOP ownership in 2012. In an industry where other craft brewers were selling to multinationals, New Belgium took a significant step toward remaining independent, toward sharing wealth with employees—and toward sparking a trend among other craft brewers. When co-founder Kim Jordan and her former husband launched the company in 1991, they took out a second mortgage and used credit cards to achieve an initial capitalization of $60,000. "We then got a brewery equipment vendor to help us get financing from a leasing company and an SBA loan" to open a second brewery, Jordan told Fortune. Expansion was done with traditional financing; New Belgium has never had equity investors. The two founders gave 10 percent of ownership to co-workers in 1996, through a deferred compensation plan. In 2000 they merged that plan with an ESOP, which then owned 32 percent of the firm. When the couple divorced in 2009, the company bought out the shares of Jordan's husband and retired those shares. In 2012, all remaining outstanding shares—held by Jordan, her two sons, and five managers—were sold to the ESOP. A bank provided a loan for much of the purchase, and Jordan financed the rest with a loan to the company. "Now we operate as an ESOP with a B corporation designation," Jordan said. "We disburse a number of shares to all of our owner co-workers every year." Jordan stepped down as CEO in mid-2015. Will New Belgium remain employee-owned in perpetuity? In December 2015, The Denver Post reported that the company had hired an investment banking firm to explore a potential sale for $1 billion or more. Jordan, now board chair, said no deal is pending. One source close to New Belgium reported that there is no intention now to sell, nor an active buyer trying to purchase the company. 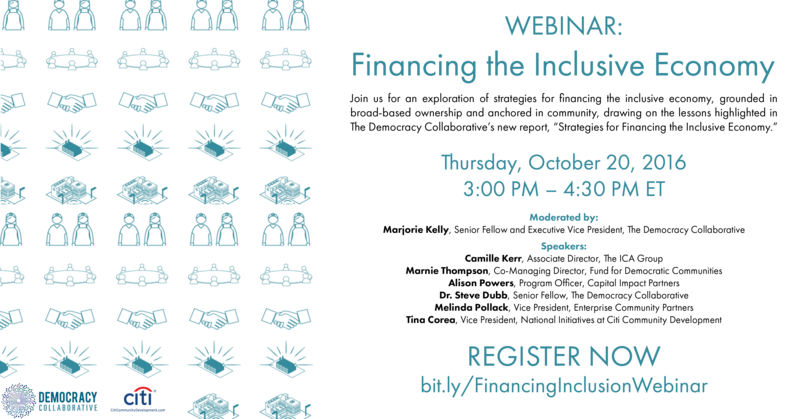 Join our webinar October 20th from 3:00pm-4:30pm ET to learn more about strategies on financing the inclusive economy.